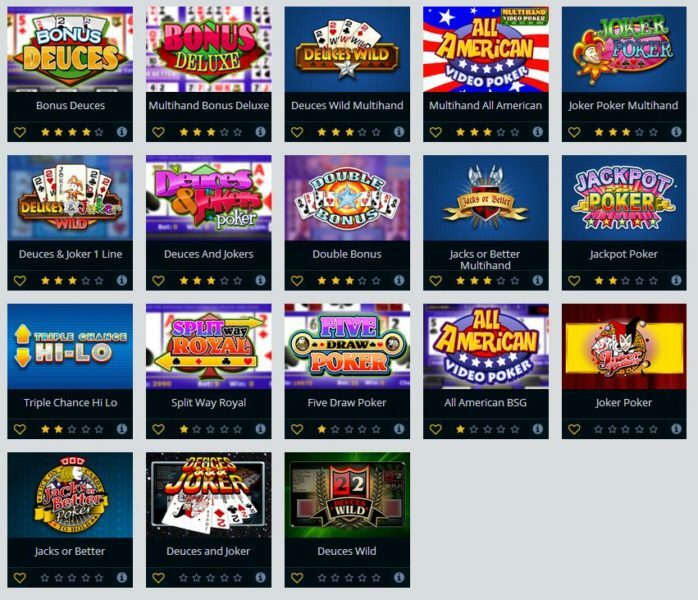 Vegascasino.io stays true to their name as you are greeted with so many games to choose from on their website! Just like the original Sin City, it is just a cluster of shiny things that you can choose from. 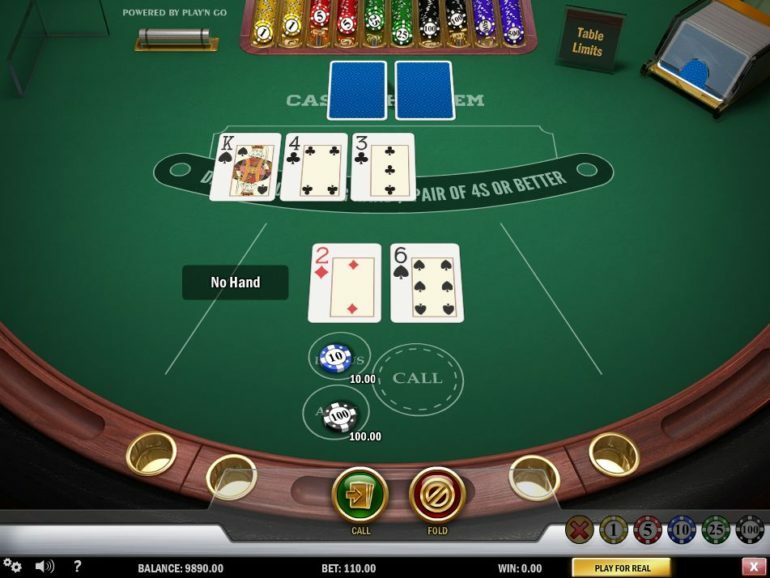 To try out their Poker games, all you need to do is click on this link and you will be redirected to the games! For Poker we have “Video Poker” and “Table Games”. Below would be screenshots and game features that you might want to read through. 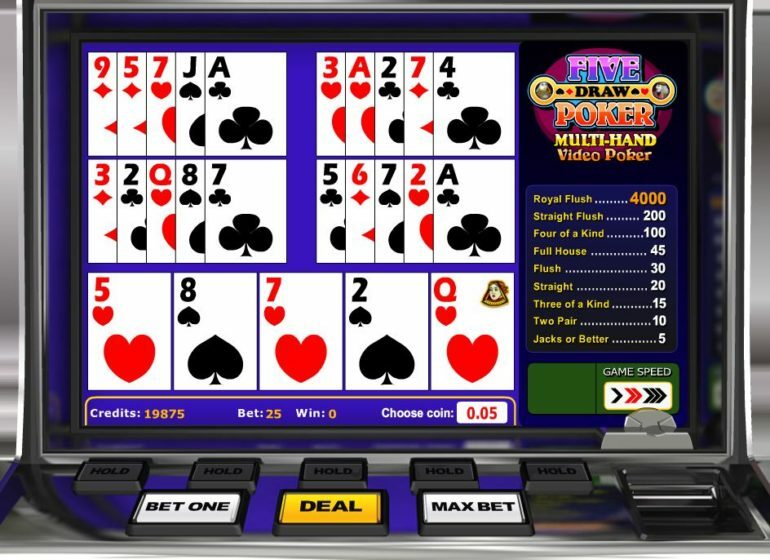 This website has the ability to let you play “Practice” games which are awesome as you can try your luck with them without breaking your bank! Slot Machine accepts 0.02,0.05,0.10,0.25,0.50 and 1.00 Coins. To play the game you need to select how much you want to bet first. Once this has been decided click on the “Choose Coin” window and select how many you want to bet per game. Click on “DEAL” and the machine will give you five cards. On the first set, you are able to choose which cards to keep by clicking on the cards or pressing the HOLD button underneath each card you want to keep. Once the cards have been held, click on the DEAL button again and this will change the card/s that you did not hold. You can play 1 to 5 coins per game. In order to choose the multiplier, you just need to click “BET ONE” multiple times if you want to bet 2-4 coins and click on “MAX BET” if you want to bet 5 coins. Slot Machine accepts 0.02, 0.05, 0.10, 0.25 and 0.50 Coins. You start the machine by choosing how many extra hands you want to play with. 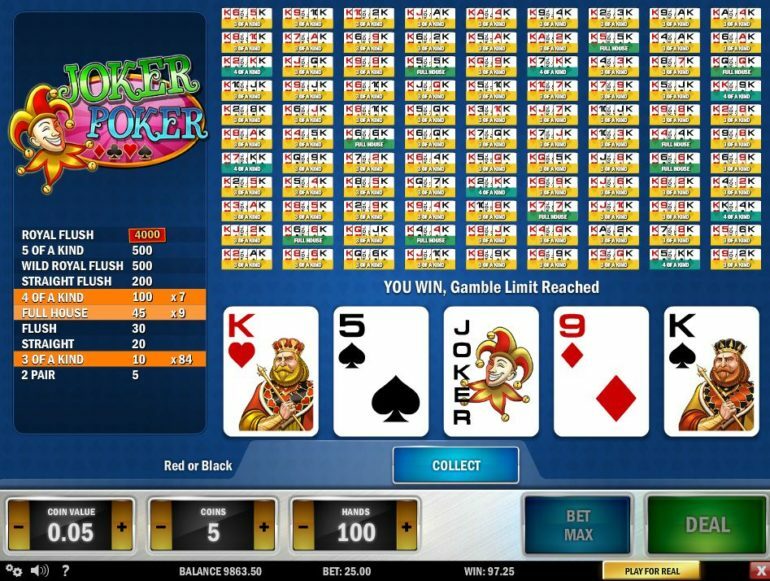 You can choose from 5, 10, 25, 50 or 100 Hands to play with. This means that aside from the one you are of course holding, you would have extra hands to maximize your luck chances of winning. 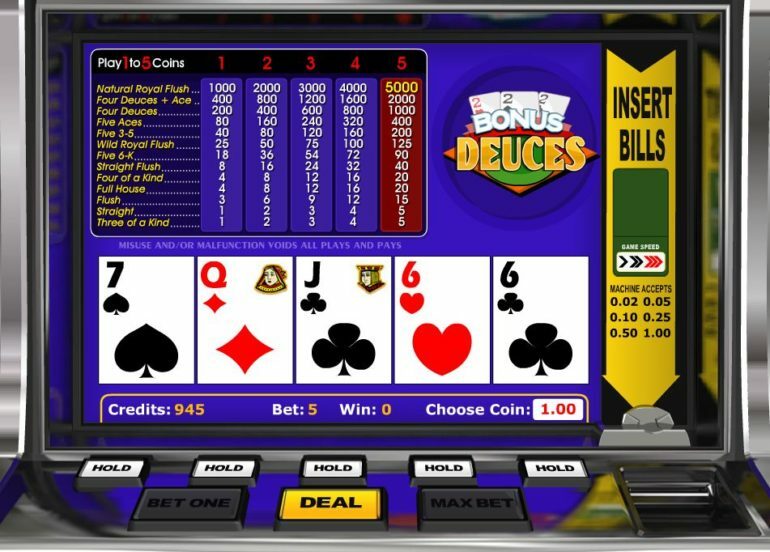 The game plays like Bonus Deuces in which you can hold cards and have the dealer change the rest. Please be advised that the cards you would hold on your original hand will also be held for the rest of your extra hands, which is shown in the screenshot above. Slot Machine accepts 0.25, 0.50, 1.00 and 5.00 Coins. Start the game by choosing how much coin value you want to play with. After that choose the multiplier, whether it be 1, 2, 3, 4 or Max Bet which is 5 coins. 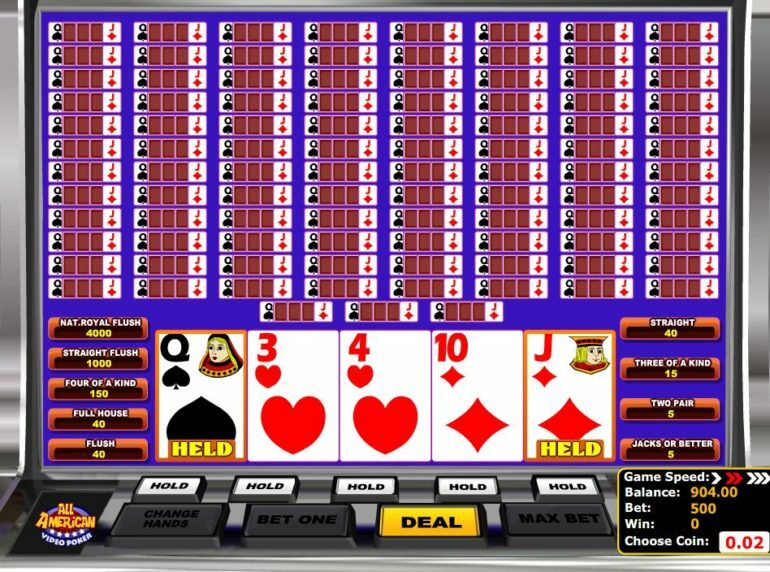 You can also choose 1, 4, 10, 25, 50 to 100 hands to play with. The machine will deal the cards and you will be able to choose which cards to hold or give up then click deal to have the machine deal the final hand. After all the cards have been drawn you will be given the chance to gamble your win or collect it directly. In gambling, you are able to multiply your win by choosing either Red or Black. On the screenshot above you can see that it says “YOU WIN, Gamble Limit Reached”. This means that we have beaten the machine and won 97.25 Coins out from our 25.00 coin bet. Slot machine accepts 0.02, 0.05, 0.10, 0.25, 0.50, 1.00 Coins. Since this is a multi-hand poker you do not need to choose your hands played. You will be given automatic 5 hands to play with. You can, however, choose your multiplier by denominations of 5. Your maximum multiplier is 25 and minimum is 5 to play the game. You can still hold cards and change the ones you do not like. Ante – Choose from 1, 5, 25 and 100 chips. The game starts by choosing your Ante. Once you have chosen your Ante the dealer will give you 5 cards and automatically arranges it for you. At this point, you will be able to choose from Fold and Call. Of course when you Fold you lose. If you Call, the system will automatically remove x2 of your Ante from your bank and place it on the table. If you have 100 chip Ante, the Call will take 200 from you making it 300 in total. You can also draw a card from your hand and change it for a price of your Ante. Please be advised that you can only draw once before your final hand. If you are going to draw and you think the hand is weak better make the choice at this point as you are no longer able to make additional Draws. Ante – Choose from 1,5 and 25 chips. 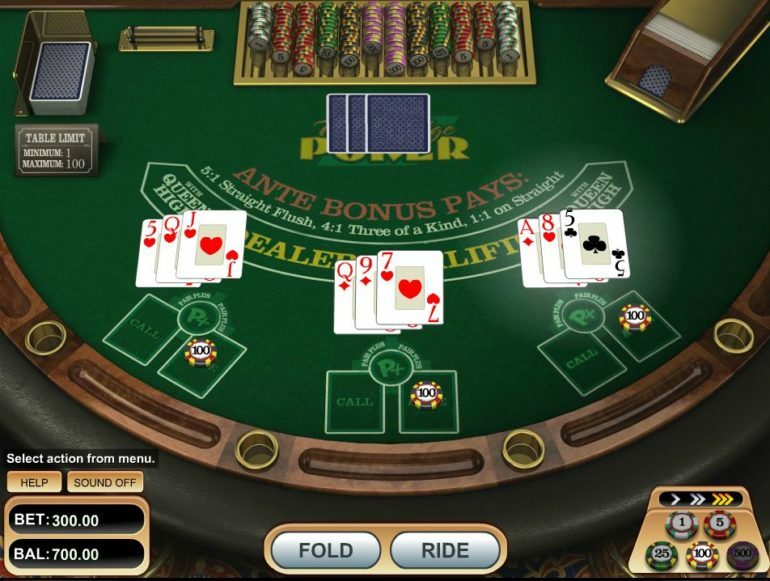 In Ride’M Poker you would have the choice to play 1,2 or 3 hands at a time. You can Minimum bet would be 3 chips and the maximum is 75 for first card dealt per hand. The game starts and the dealer gives you three cards and two on his end face down. At this point, you can either choose to Pass or Ride. If you choose Pass this will take one chip from your original Ante. For example, you have 1 x3 chips on the table you will get one chip and the dealer opens one card. If you Pass again the dealer opens up the last card that is facing down. You can also choose to Ride all cards if you want. Ante – Choose from 1,5,10,25 and100 chips. To start the game you need to choose your starting Ante. At this point, you are able to either play with a double Ace Bonus with a minimum bet of 1 chip to a maximum of 50 chips. Once you have decided the amount you want to bet click on “Deal” and the game will start. The dealer will deal two cards on your end, two for him and three open cards in the middle. 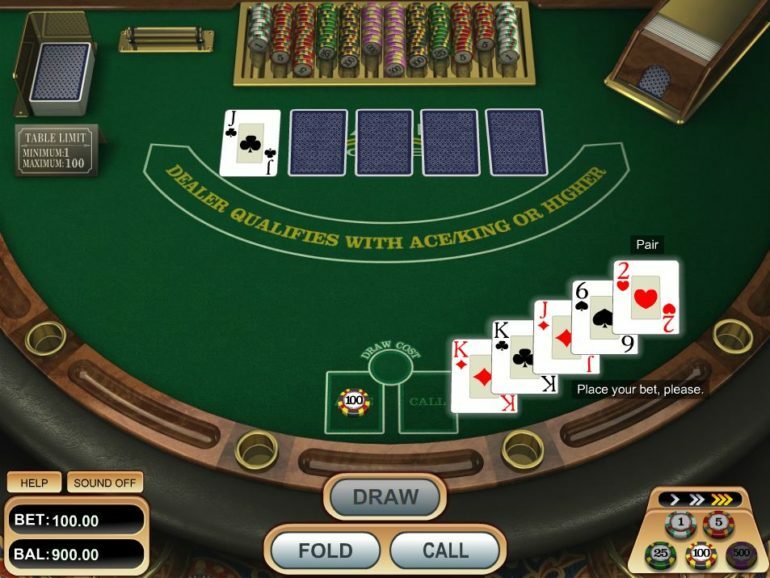 At this stage, you are able to choose to Call or Fold. If you press call the system will automatically take x2 your Ante. If you have a hundred for the Ante then choosing Call will take additional 200 from your bank making the total bet of 300 chips. Before you start the game you will be able to choose between 1-3 hands to play with. Minimum Ante per hand is 1 chip and maximum is 100. Once you have decided how many hands to play, place your bets and click on Deal. The game starts as the dealer gives out three cards per hand. There are only two options available after you have been dealt the cards. It’s either you choose to Fold or Ride. Of course choosing Fold will automatically forfeit that hand’s Ante and move on to your next hand if you have available hands to play. 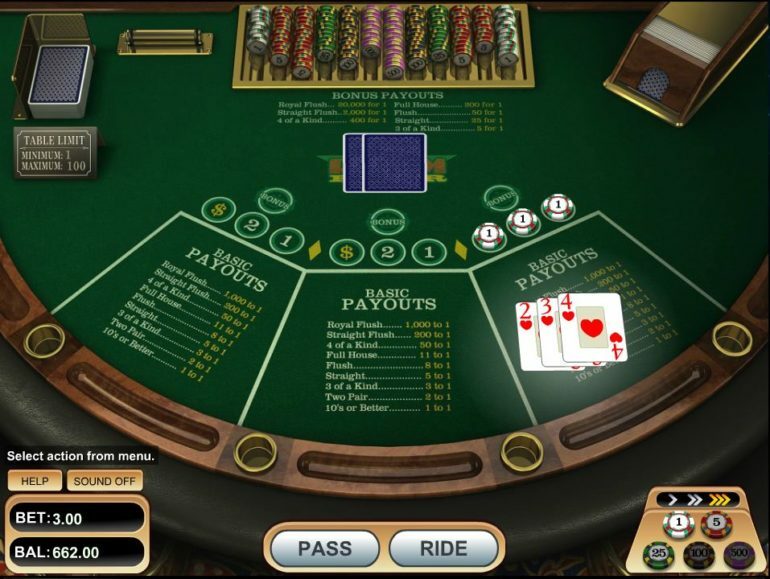 Choosing “Ride” will add an additional Ante (based on your original Ante) to the table per hand, this means that you are doubling your bet per hand. The website is filled with games to choose from! If you do not know what to play prior to going to their website, you will be overwhelmed! This is a good website to just sit and relax and waste your time in looking for the next game to play. Just remember to do Practice games first for games that you have no idea in playing.